If you had 48 hours on the moon, what kind of art would you make? Giant Steps, an exhibition of conceptual art proposals, asked that question, and I was very pleased to be selected. Giant Steps was curated by Greg Lundgren of Vital 5 Productions. It runs March 5 – 27, 2016 at King Street Station in Seattle. 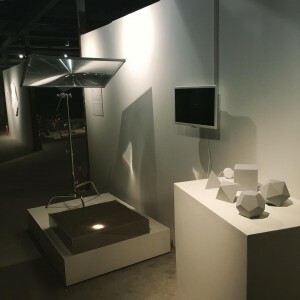 The installation included a large 27″x37″ Fresnel lens that focused a light beam onto “moon dust” to evoke the sintering process that can be achieved with energy from the sun, the pitch video, and 3D laser sintered prints in alumide of each of the 5 Platonic solids. Catalyst Endowment was selected as the People’s Choice award winner by popular vote! ‘Giant Steps’ Wants to Put Art on the Moon, But Should We? 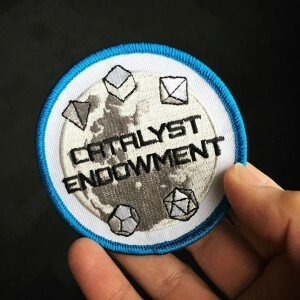 Project Description: Catalyst will use sunlight to fuse moon dust into sculptures which will be brought back to Earth and auctioned at Sotheby’s, resulting in a large endowment to fund future Moon Art residencies. On the lunar surface, the artist will assemble a specially designed 3D printer, the Lunar Sinter, which focuses sunlight into a beam that fuses (“sinters”) moon dust into a glassy metallic solid, creating 3D figures layer by layer. Moon dust is rich in iron and silica, estimated to be valued at $50,800 USD/gram. The artist will print figures of the 5 Platonic solids (representing earth, air, fire, water, and the heavens), while the experience is streamed live to viewers on Earth. The 3D printer will be left on the moon for future visitors to use. The figures will be taken back to Earth and auctioned at Sotheby’s to create a $10M non-profit arts fund for future Moon Art residencies. Cargo: The Lunar Sinter design will be based on similar “solar sinters” that have been used in the desert on the Earth (see Markus Kayser’s brilliant work printing with sand), and will use lightweight, moon-worthy materials. The artist will work with her engineering design team to utilize best practices from NASA and JPL to keep costs, weight and volume within parameters of the residency.